Back when I was pregnant with Bryce, I wanted to fully experience every moment of my pregnancy. I couldn't wait to wear maternity clothes. I started counting down the days until my monthly doctor's appointments when the month was only halfway done. I milked the tiny bit of morning sickness I had and indulged myself in taking naps whenever the opportunity presented itself. When he was thirteen months old, I got pregnant again. This time, I didn't even make an appointment to see a doctor until I was out of my first trimester. I tried to put off wearing maternity clothes for as long as possible. I knew exactly how long nine months of pregnancy felt, and even though I was thrilled to be having another baby, I wasn't thrilled that I had to wait for her arrival for almost a whole year. But as the second trimester rounded into the third, I found that I was just as excited for Annie's arrival as I had been for Bryce's a little less than two years earlier. I felt similarly this summer when we started our wait for you. I'd just waited for a baby for a whole year, and those hard months when I spent the days willing the phone to ring were still so fresh in my mind. So we said yes to you, but even as I was going through the steps we needed to accomplish to bring you home, I kept a little piece of my heart locked away. If I gave myself over completely, the way I had when we were expecting Bryce and Rose, I was afraid I might not have the energy to get through the next eight or nine months with my sanity intact. We've now had your picture written in our hearts for almost four months and on our kitchen wall for three. In fact, the kitchen wall is full of you-- there are about forty pictures of your sweet bald head and your big brown eyes. On Monday, we got the news that our dossier has gone "in process" which, to the best of my understanding, means that it has been translated and that sometime in the next few weeks, the Chinese government will officially approve you to become our son. Last time we waited for more than six weeks for this step to take place, and this time, we were only logged in a little more than three weeks before we got the word. So it looks like one of my biggest fears, that your file would get lost on some bureaucrat's desk, where it would wait for 160 days, is not going to come to pass. With any luck, we'll have our LOA by the first of the year. But me, silly, impatient me, can't help but hope it's here for Christmas, or better yet, by December 15th, which is when we got Rose's LOA last year. Now that we only have about four months until we travel (fingers crossed), I'm starting to feel a hint of excitement. I'm thinking about the trip, and medical specialists, and baby clothes, and double strollers. While I couldn't be emotionally invested in the process for eight or nine months, I think I'm giving myself permission to be emotionally invested for four. When I look at your face, I feel a stirring in my heart. I'm getting excited, even for the prospect of two crazy toddlers who will run me ragged. Before we know it, I'll be your Mama. On Sunday you turned thirteen months. You're probably not walking yet, since I have photographic evidence to prove that you spend most of your day in a pink and yellow walker, but I have no doubt that you will be running around the house like a maniac shortly after we get you home. Just writing that wears me out, because your big sister runs me ragged on a daily basis on her manic pursuits of garbage cans to dig in, bookshelves to empty, crayons to eat, and anything below a height of four feet to break. I love babies. But toddlers, man, they wear me out. Rosie had surgery last week to close her soft palate, and while she came through it like a champ, she has been anxious and clingy and ornery since. She will demand food, and then throw it on the floor, then scream for more. She won't let me out of her sight, but she's likely to hit and scratch me when I pick her up. But just when I'm ready to hand her over to Daddy the minute he walks through the door (which both of them would love), she will do something so adorable that all, or at least most, of my frustrations are forgotten. It's a darn good thing she's cute. Although I haven't heard the official word from China yet, my guess is that we have now moved into the LOA wait, which is the most grueling part of the adoption process. Last year, I think I went three-quarters of the way to crazy during the 63 days we waited. The problem isn't the length of the wait. If I knew I had to wait 63 days, I wouldn't like it, because that would be 63 days where I couldn't be with you, but I'd be fine with it. The problem is that nobody knows how long the wait will be. Right now, it seems that an average wait is around 55 days, but the average could easily be as few as 35 or as many as 80 by the time they get around to issuing ours. I know of someone who recently got their LOA in eight days, and I also know of someone who got theirs after waiting for 165 days. And there seems to be little rhyme or reason for whose paperwork gets pushed through quickly and whose takes a long time. So during the wait the last time, my angst wasn't triggered by wondering if I'd wait 60 or 70 days-- it was triggered by fear that I'd be the one to wait 165. But this time around, if I'm being 100% honest, while I am still terrified about waiting 165 days, I'm also a little bit terrified about having two toddlers to chase, wrestle, feed, diaper, wrangle, and get in and out of car seats 20 times a day to drive your older siblings places. Rose is the greatest blessing I never thought I'd have (so far-- oh gosh, am I inspiring competition before you're even home? ), but I fall into bed exhausted every single day. How, oh how, am I going to manage with two of you? I'm sure we'll find our groove. We're going to bring her to China with us, so you'll have a chance to know your baby buddy before you get introduced to the rest of the clan. But I hope you'll be forgiving of me if I don't do everything right over the next few years. I promise I'll do my best. I guess the good thing is that you probably won't remember my mistakes. The Unlikely Gift of Treasure Blume, by Lisa Rumsey Harris, whose 2006 essay “Honor in the Ordinary” won Segullah’s Heather Campbell essay contest. 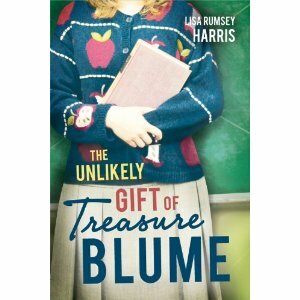 Treasure Blume, to be published tomorrow by Cedar Fort, is the kind of book I’d buy for my mom or my sister, or really for anyone who I think could lose themselves in Harris’s story, which is sweet without being saccharine, uplifting without preaching, and just downright funny. Treasure is a first-year elementary school teacher living in Las Vegas who has the curse (or the gift?) of rubbing all adults the wrong way when she meets them (maybe it’s the embroidered sweater sets, the polyester, or the poodle perm, or maybe it’s something that goes deeper. It’s no accident that it took her 44 interviews to land a job and was finally hired by a truly desperate principal. Because Treasure has been aware of her effect on people ever since her Granny Blume pointed it out to her when she was a teenager, she’s spent the last decade making up for it, finding ways around it, and never using it as an excuse (which is what Granny, cursed with the same family “gift”) did for most of her life. Little kids and old people have no problem with Treasure’s quirks, and if her peers spend their time getting to know her, they learn to appreciate her too. So when Dennis Cameron, Mr. Lunch Lady at Treasure’s school and the father of one of her students, enters the picture, it’s not too much of a surprise what will happen. I appreciate that Harris complicates her characters and makes them feel three- dimensional, but not at the expense of keeping the story fun and light. I read the book in one sitting yesterday afternoon, and with the snow falling outside and the story to keep me entertained, it was a perfect day. I also wanted to take a look at iPlates by Stephen Carter (author) and Jett Atwood (illustrator) and published by Leicester Bay. I went into it without knowing much about comic books, but I liked what I saw– basically Carter and Atwood turn the Zeniff/Abinadi/King Noah/Alma cycle (with some Ammon thrown in for good measure) into a story a prepubescent boy would love, with plenty of blood and piles of arms and made up Nephite curse replacements. I can’t really comment on how the book works as a comic book, because I know next to nothing about that, but as entertainment/a gentle push toward doctrinal stories for a Mormon? I think it succeeds. My eight-year-old has the day off school today, and he came and found me curled up in bed, reading iPlates. He pulled the iPad out of my hand and tilted it toward him, and we sat next to each other in my bed, reading together. After he finished, he said, “Wow, that was cool.” I’m pretty sure that he will make sure that the iPad makes its way into the church bag from now on. A few weeks ago, my mom and I went into Deseret Book, searching for a gift she could give to the aforementioned eight-year-old. There was plenty of girly jewelry and books explaining the concept of baptism, books which would, truth be told, probably sit on a shelf and go unread. 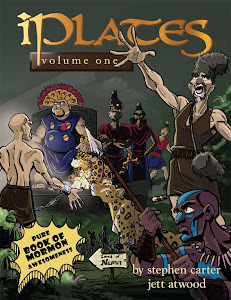 But iPlates would be the perfect baptism gift for an eight-year-old boy.